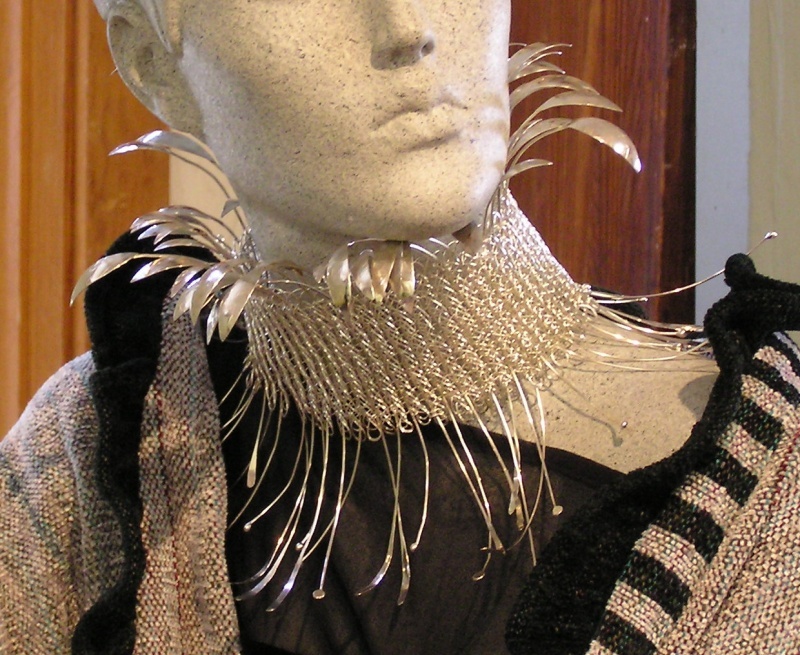 I made "Chaos" knitted collar necklace with sterling leaf tendrils threaded thru the knitted structure last summer. I originally called it "Dancing Leaves" but Bev, one of my students nicknamed it Chaos, so I renamed it as "Chaos". I had this vision of silver leaves on wire, surrounding the neck like a wreath. After trying to weave multiple strands of wire, I gave up and started knitting a large tube that I cut open to create a Elizabethan ruff. I originally was going to have a silver leaf on each end of each wire, but it got a little overwhelming. I alternated hammering and balling up each end of wire on the bottom of the collar. I ended remaking it but it's more successful. I had it on display at the CraftWear Exhibit at the Annual Craftsmen's Fair last year, and then sent it off to Art Ability, an international juried art show at Bryn Mawr Rehab Hospital in Malvern, PA, that is hosted every fall. I have been doing Art Ability for years so I do my best to create new work that I normally don't make or sell in NH/MA. Chaos ended up winning 3rd place in the craft division, and I was asked if I would allow it to remain on display for a full year. Bryn Mawr Rehab Hospital just bought it for their permanent display, so it's fitting that Chaos will be on display for many years. It can be worn but it's not the most practical necklace, but that's ok, it's the creativity that matters. Sometimes you have to go out on a limb and make work that isn't practical or wearable because your vision or idea requires you to make a leap of faith. I do enjoy pushing myself beyond what I normally do and stay fresh.